The abandoned medieval church of Badia Pozzeveri in Tuscany, Italy, which is surrounded by a 1,000-year-old cemetery, has had some unique visitors in the past four summers. 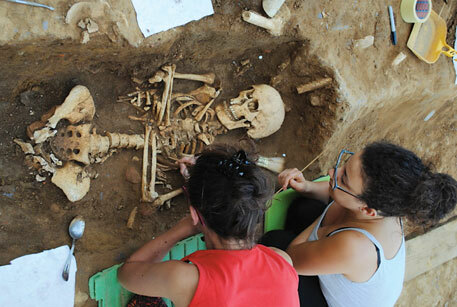 Led by scientist Clark Spencer Larsen from the Ohio State University in the US, these researchers and students have been excavating the site where they have found a mass grave of victims of cholera epidemic of the early 1800s. The deceased were buried in a casing of lime to contain further spread of the infection. “The lime encasing is amazing for bone preservation. These are the best preserved remains of cholera victims from this time period ever found. We are very excited about what we may be able to learn,” says Larsen. So far, the researchers have found DNA of microbes in the bone remains. These microbes were present in the bodies at the time of death and could be Vibrio cholerae that causes cholera. The researchers are also excavating other graves in the site, which are presumed to be of victims of the Black Death, the pandemic that killed millions of people across Asia and Europe in the 14th century. 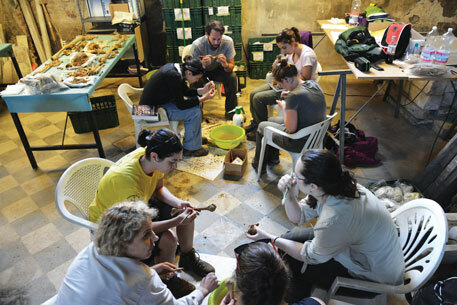 Larsen’s team is not the first one to study modern diseases using archaeological remains, also known as palaeopathology. Scientists are increasingly using this field of science to predict the course of a disease in the future by understanding its history based on the evidence from ancient remains, including bones, teeth and dental tissue. Diseases often leave direct or indirect imprints on the skeletal system, as in the case of osteoporosis, and sometimes, tuberculosis. While skeletal remains inform about the past, advance tools, such as biotechnology, help map and study diseases of the past. Helen Donahue, from the University College London School of Life and Medical Sciences, explains the relevance of studying ancient remains to modern medicine. “Paleopathology can provide evidence of the epidemiology and past geographical range of ancient infections,” she says. “It can also give insights into the social context of past human infections. For example, leprosy is linked with rural populations and mud floors, whereas TB is linked to the density of population so it increases in cities. This is seen as long ago as ancient Egypt,” she adds. Donahue has extensively researched the history of tuberculosis and leprosy. A recent work was a 2012 study published in the New England Journal of Medicine. The study conducted on bodies found in a sealed crypt in Vac, Hungary. The bodies were buried between the late 18th century and early 19th century, and were found to have been naturally mummified due to conditions prevalent in the crypt. A large percentage of the bodies were found to have been infected with tuberculosis and the samples obtained were sufficiently intact to enable molecular fingerprinting of the strain of Mycobacterium tuberculosis (MTB). “We have found that several individuals were infected with more than one strain of MTB, and one individual had three different strains,” she says. “They were all from modern lineage-4 (European) but can be distinguished from each other. Today, this pattern of infection is found in sub-Saharan Africa and there was speculation that it may have been driven by HIV and/or the impact of antimicrobial therapy. Our data from the 18th century suggest that this phenomenon arises whenever there is a high level of infection in the population,” she continues. In certain cases, the disease in question may not affect the same demographic as it did in the past. A 2012 paper by Mauro Rubini from the University of Foggia, Italy, studied the case of childhood leprosy in two mummies excavated from the second-third century BC and 8th-10th century BC, one of which yielded the DNA of Mycobacterium leprae. The study was published in the International Journal of Osteoarchaeology. While childhood leprosy is now a rare occurrence, the study of the disease is nevertheless important due to a lack of historical literature on the subject. “These are real-time markers of genetic changes, thus enabling better understanding of the evolution of human pathogens,” says Donahue. There have also been instances where DNA evidence from remains has been used to prove or verify theories about the history of a disease. Kirsten Bos, physical anthropologist from Canada’s McMaster University used DNA obtained from a burial site in London to prove that the culprit behind the Black Death was Yersinia pestis, the highly virulent bacterium responsible for bubonic plague. She thus silenced opposition to the theory from researchers who claimed that the medieval pandemic was caused by a virus similar to Ebola, an idea that received some traction, thanks to the book published on the topic. Bos further proved that all modern strains of the disease had evolved from the strain responsible for the Black Death. This information may be imperative in understanding a disease which has still not been completely eradicated. India’s last recorded plague outbreak occurred 20 years ago in Surat, claiming numerous lives. Minor outbreaks are reported each year all over the world, including a major one in the Democratic Republic of Congo in 2006, indicating the continuing need for further study of the disease’s history to truly understand its propagation dynamics. Studying these diseases may even give us clues about human history. Studying obligate pathogens, such as M leprae that have co-evolved with their hosts, may provide information about human migration across continents.